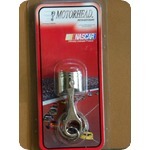 This is for 2 NASCAR licensed key rings. These are made of metal and are of the best quality. Jeff Gordon's number 24 and signature are on the top of the piston. They sell for $6.99 each. Our items come from a smoke and pet free home. We combine shipping!! !